$20 for credit card, BPay and Australia Post. No minimum deposit for other methods. $0.50 for racing; $1.00 for online, Speech Express and Touchtone phone sports wagers and $10.00 for wagers over the phone with an operator. Tab.com.au is part of the Totalisator Agency Board also known as TAB. The organisation was owned by the government of Australia before some of the branches were privatised by investors. The privatisation of the monopoly totalisator sector began in 1994 and the first on the list was the Victorian Totalisator Agency Board. Later on almost every division of TAB was privately held. 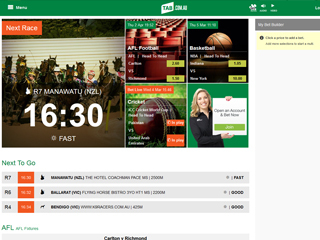 Tab.com.au and all its operation are directed by Tabcorp Holding Ltd. This Australian online gambling giant is offering the public a vast range of entertainment products and it’s one of the biggest publicly listed gaming companies worldwide. In 2012, Tabcorp had nearly 3000 employees, and the number continued to grow to these days. According to the statistics, the corporation has more than 1.2 million active customers and owns both of the largest Australian totalisator pools – NSW and Victorian totalisators. The TAB business gained a lot of popularity and nowadays counts about 310 000 regular sports betting customers. There is a strong retail network as well with 622 retail outlets in Victoria alone and 1 948 in NSW. The list goes on with various other ventures owned by the Tabcorp. Tab.com.au is among the top 30000 most visited websites globally. The metric says a lot about the bookie’s popularity. The quality service and great offers keep getting players like a magnet. TAB provides a great offering for more than 20 different sports and a large number of leagues for all of them. The offering is very similar to many other bookies on Australian soil as they all are pretty much aligned with each other. Of course, the most popular Australian sports are favored and have more betting options than the others. Some of the events that are most well catered for are horse racing, greyhounds and harness. They can be covered across Australia, Singapore, New Zealand and the UK. The website interface is well managed over time and certainly changes almost every year with new additions and improvements. Live betting and mobile experience are supported as well. One of the most exciting features is the phone betting option with a speech recognition system called Speech Express. For those who like to wager on casino or other games, TAB is not the place to do so. The online bookmaker is focused strictly on sports betting markets without any other distractions. When it comes to gambling, there are few competitors out there how can provide better odds for most of the popular sports. TAB is a perfect example of a bookie where professional players can effectively grow their investment. The overall betting margin for this online bookie is calculated to 6.1%. However, some sources suggest that it might be lower with an average of 5.1%. There is a minimum bet set to $0.50 for racing and $1 for online wagers. Any bets handled by phone require a minimum of $10. TAB’s maximum betting values may vary, but, in general, there are larger bets accepted on a regular basis. Football betting is quite developed, and the fans will be surely excited to make their wagers with TAB. There are simply tons of football betting types available and let us list some of the most popular ones. Every player can enjoy First Goalscorer, Correct Score, Half-Time Result, Half/Full Double, Double Chance, Total Goals Under/Over, Draw No Bet, 1st Half Exact Goals, Both Teams to Score, Corners, Wincast, Player to Score and many more. Multi betting and Systems are enabled in numerous variations, so the clients can smoothly build up their strategy. TAB is one of the most financially stable companies in Australia, and it can also compete with many in world class online bookmakers. When it comes to technical security, the sports betting provider employ SSL connection on the website with a reliable encryption. There is no specified protocol verification. However, a company like Tabcorp surely has increased protection measures. The customer support department is perfectly adequate and responsive even to the most delicate requests. The team answers on phone or email, but you can also contact any TAB’s representative on the social media, such as Twitter, Facebook or even Youtube. There are also various languages supported that you may easily review the following table. TAB allows its customers deposit funds into their accounts with various payment options. You can easily review them in the following table. Of course, some of the most reliable methods are used, but when it comes to withdraws, the choices are not that many. Australians can easily deposit or cash out their winnings via any TAB retail store. There are no transaction fees of any kind, but some minimums apply to deposits. For example credit cards, BPay and Australia Post have a minimum required amount of $20. A wide variety of currencies is supported as well, and you can see them all on the table. Unfortunately for many new gamblers who like to join TAB, there are no welcoming bonuses associated with the bookmaker. Tabcorp relies on its attractive odds and large offering rather than bonuses. However, you can find some exciting promotions on their website. Most of them are seasonal or linked to some special events, but the regular player will surely find them quite attractive. There are also jackpot pools and a great loyalty program called TAB rewards. Every customer can generate points and use them for special rewards and other fine experiences.